Some breeds of dogs are taller than others, but have you ever wondered which one holds the record for the world's tallest dog ever? Several dogs have earned this title over the past few years. Not surprisingly, the tallest dogs on record are Great Danes. This breed may well be the world's largest lap dog. The males average 30 inches or more at the shoulder and weigh up to 120 pounds. They are a lean dog with a rectangular head and very short coat. Although the breed is large, Great Danes are known for their gentleness and devotion to their families. They literally will sit on your lap, snuggle with you in bed until you fall off the edge or take over your favorite chair. If you have ever enjoyed the comic strip, Marmaduke, you have been entertained by one of these lovable giant dogs. Each of the following record holders is a Great Dane. Shamgret Danzas was once the tallest dog on record. This Great Dane weighed 238 pounds and stood 41.5 inches tall at the shoulder. Although Gibson died of bone cancer, he had a long run as the tallest dog in the world. He was certified by the Guinness Book of World Records in 2004. He stood 42.2 inches tall at the shoulder and weighed 170 pounds. Titan held the record for the tallest dog in 2009 until George took the title away from him. Titan weighed 190 pounds and stood 42.25 inches from floor to shoulder. He was blind, deaf and had multiple health problems. Giant George, another Great Dane, was the record holder until he passed away in 2013. The Guinness Book of World Records sent an examiner in early 2010 to check the measurements of this dog. The examiner found that George was seven feet and three inches long from his head to the tip of his tail, and he weighs a whopping 245 pounds. George is 43 inches tall at the shoulder. This was verified by an official of Guinness World Records. George eats over 110 pounds of food every month. He has to bend over to drink from the kitchen faucet. George has his own queen size bed. He sits in a chair like a human would; he is too big to curl up. After Giant George passed away, Zeus took up the mantle of World's Tallest Dog. He measured three feet eight inches high. In comparison, a donkey is about the same height. Lengthwise he was seven feet four inches long, and he weighed 155 pounds. In order to keep Zeus fed, he required about one 30 pound bag of food per day! Zeus passed away in 2014. He's so big he has to sleep on a regular bed made for people. He was surprisingly the runt of the litter when his owner picked him. He weighs about 200 pounds and eats about one kg (2.2 pounds) of beef, 250 grams (.56 pounds) of casserole steak and 300 grams (.66 pounds) of liver each day. He and his sister have destroyed at least 26 couches together. Despite his busy couch destruction schedule, he sleeps about 20 hours per day. How tall is the tallest dog on earth? Freddy is so tall when he's standing he towers over the average height of an NBA player at seven feet six inches. Anatolian Shepherds are a Turkish breed that weighs up to 150 pounds. They are about 30 inches tall at the shoulder. Borzoi resembles long haired Greyhounds. They are usually lean and weigh only about 100 pounds, but they may grow up to 28 inches tall. English Mastiffs may weigh over 200 pounds, but they usually only reach 30 inches or so at the shoulder. Irish Wolfhounds average about 31 to 34 inches at the shoulder and weigh up to 180 pounds. Saint Bernards are huge dogs that weigh from 160 to 240 pounds and stand up to 35 inches tall. Scottish Deerhounds look something like an Irish Wolfhound with a shorter coat. They may weigh up to 110 pounds and measure 32 inches at the shoulder. Larger dogs also tend to have a shorter lifespan. The average Great Dane, for example, has a lifespan of seven to ten years. Compare that to smaller dogs that may live 15 years or longer. However, large dog lovers are willing to accept this fact and try to make the most of their time with the breeds they adore. The world record for the biggest dog was Zorba, an English Mastiff. He was the heaviest dog in the world, weighing in at 343 pounds and eight feet long. Like the Great Danes who receive the tallest dog world records, Zorba can be compared in size to a donkey. A Great Dane named Balthazar earned the distinction of the Biggest Dog in the World 2017 and Biggest Dog in the World 2018. Balthazar lives in England and weighs 16-1/2 stone (231 pounds). He's not quite as tall as Freddy at three feet three inches at his withers and seven feet when standing. If you're wondering who the smallest dog ever was, it is believed that Sylvia, a Yorkshire Terrier in England, held the record. She weighed four ounces total and was two-and-a-half inches tall and three-and-a-half inches tall. Currently, the World's Smallest Dog is a Chihuahua named Miracle Milly who lives in Florida. She weighs slightly more than a pound and is only three-and-four-fifths tall. Chihuahuas are also considered the smallest dog breed. Purin, a female Beagle, holds the world record for catching the most balls within one minute. Purin caught 14 balls in her paws! She also has the world record for traveling the farthest on a ball which was approximately 33 feet in a little under 11 seconds. Mochi, a St. Bernard, has the world record for longest tongue. Mochi's tongue measures an amazing 7.31 inches. A pair of rescue dogs holds the world record for several acrobatic feats. Geronimo has made the most rope skips within a minute (91) and the most double dutch style rope skips within a minute (128). Her buddy Feather has made the highest jump at a height of 75.5 feet. 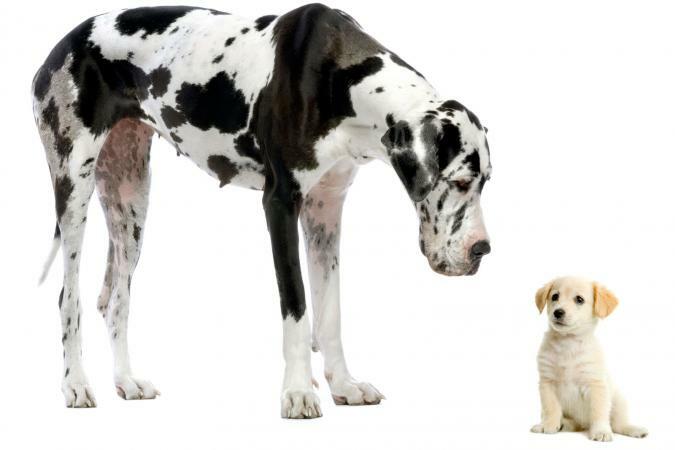 Despite the fact that some of the tallest dogs on record are bigger than a human when standing up, you'd be surprised to know that all of them had a reputation for being extremely gentle. It's a good thing a dog as large as Freddy considers himself a lap dog at heart!